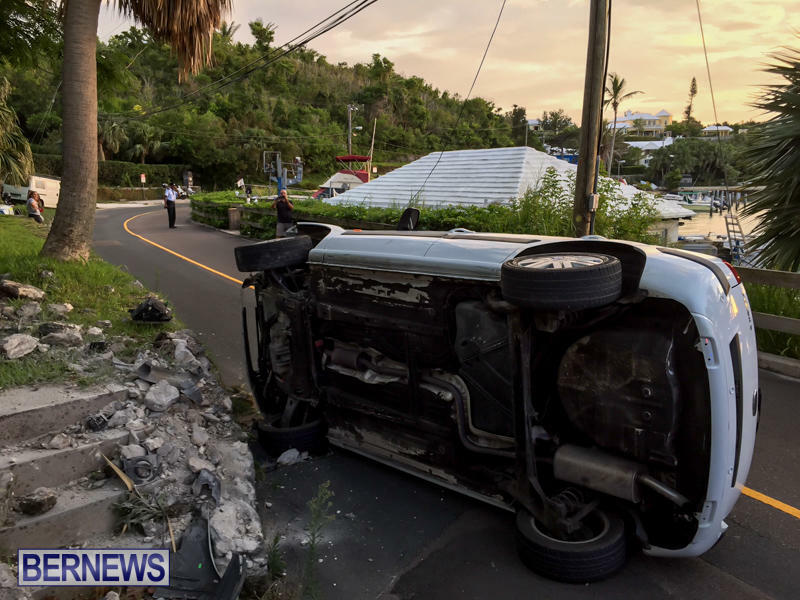 [Updated with video] Emergency service personnel attended the Harbour Road, Paget area shortly before 8.00pm tonight [June 23] where the driver of a car appears to have escaped serious injury after the vehicle he was in was involved in a collision that resulted in the car landing on its side. Further details are limited at this time, however we will update as able. Update 9.36pm: Video of the car being removed added below. Update 10.56pm: Police spokesperson Robin Simmons confirms that the “car driver involved was arrested on suspicion of impaired driving”. 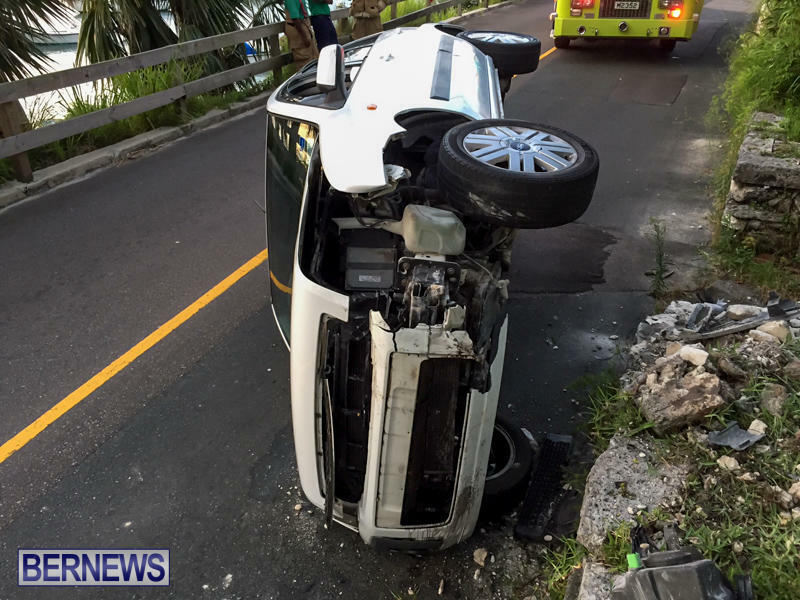 Update June 24, 12.02pm: A police spokesperson said, “Around 7:50pm on Tuesday, June 23rd first responders were dispatched to a reported single vehicle damage only collision on Harbour Road in Paget, near the junction with Lovers Lane. 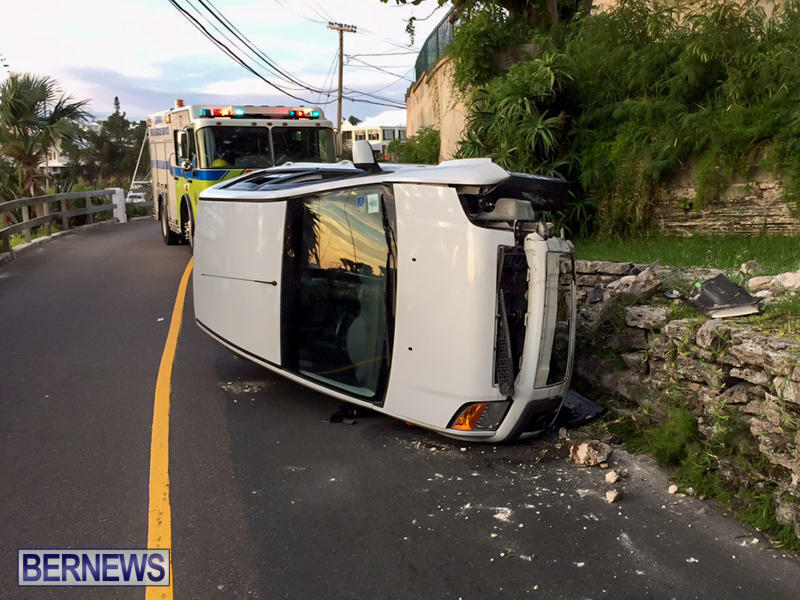 “It appears that a car being driven along Harbour Road in the vicinity of ‘Red Hole’ collided with a wall, ending up on its side. “The driver, believed to be a 35 year old Devonshire man, was apparently not injured and subsequently arrested on suspicion of impaired driving. 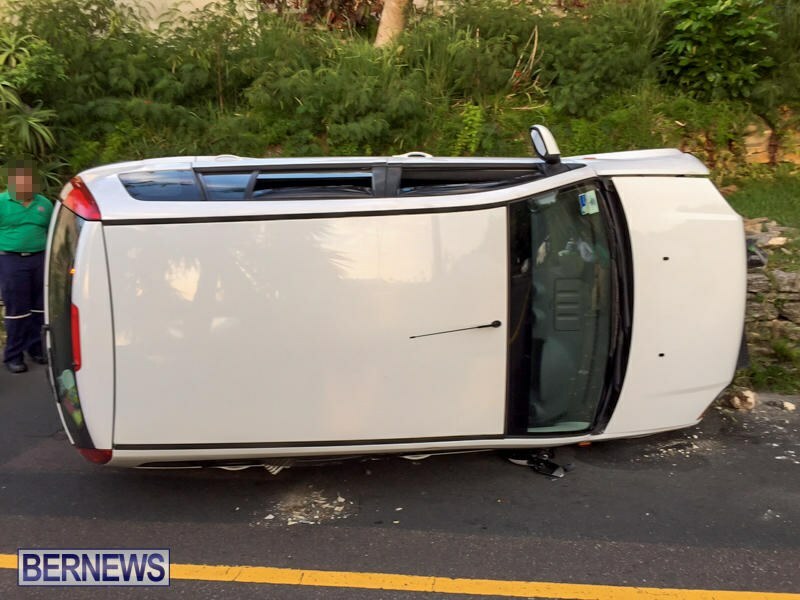 The car was said to have received extensive damage. 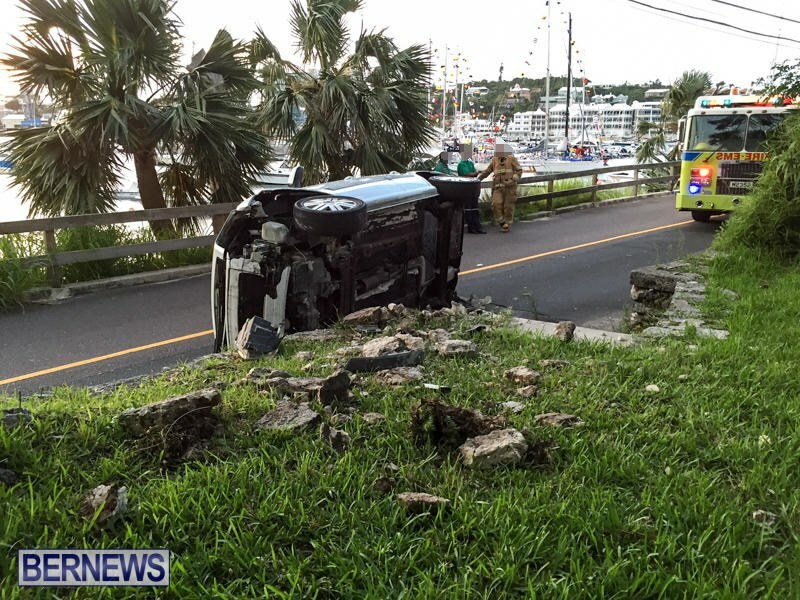 Very little doubt, Bermuda has some of the worst drivers! James Rego. You have no idea what happened here and yet you jump to conclusions and have given yourself the powers of judge and jury. I’ve had an accident because of a dog that ran out into the street to chase a cat. I have swerved to avoid children riding bikes. I have nearly destroyed my car when I swerved to avoid killing a speeding idiot trying to evade police. I have had near misses because of people overtaking cars coming in the opposite direction. I have known people to faint, fall asleep, have a heart attacks while driving. My point is that you have no idea what happened here? I hope that wasn’t someone you know or love. Next time try saying something like “I’m glad that the driver wasn’t hurt”! Reserve judgment until you know something. A picture may be worth a thousand words, but it does not tell the whole story. I’m just grateful that nobody was seriously hurt. Rego is right. Some of the driving here is awful. “arrested on suspicion of impaired driving” doesn’t seem like @James Rego is jumping to any conclusion. DUH… The guy was drunk… He got arrested!! Where are YOU living?? No the truth of the matter some of the older folk think that they can drive like the Duke’s of Hazard’s and the Young folk think they can drive like The fast and Furriest, either way the jokers need to know that they can not drive on these roads like they are on a open highway, after all some of the craziest drivers in my life here in B.D.A, came from my own family and we were known as The night Nurses, 4 door Toyota corolla’s station wagons, and what was up under those hoods was for the race track not for the road, but we thought we could rule the road, so the lesson then was less traffic but just as dangerous, and today more traffic on the road and much more dangerous. No Bermuda has some of the worst drinkers! And then they TRY and drive!! I have been saying this for the last 30+ yrs!! That’s why I always drank at home or had the wife drive!!! I second that lol. Florida has by far the worst drivers on the planet. Hope this individual is ok. The US cops do NOT “mess around” with DUI drivers!! Off to jail you go!! I guess It’s not ford tuff like they say.I bet he was not paying attention on this one, probably doing something he wasn’t suppose to be doing, anyways I hope the person is okay. Yes indeed James because nowhere else are there as many collisions as here. This island is soooo tiny. Why the hurry? My favourite people are the ones who pass you, and you keep at the speed limit, only to catch up with them at some back-up or stop light. I do hope the people in the car are okay though. It’s NOT about speed… It’s about booze!! He was probably looking at the Marrion Bda Race boats at the RHADC dock. In any event that road from the club rd to beyond the parking area on the south side going both east and West is like a dollar coaster ride there have been so many repairs Watlington water broken pipes resurfacing sections its down right dangerous for motor bike riders. Let me guess, the roads were wet and slippery??? Another person doing their part to keep our auto insurance rates high!!! Congrats!!!! Agree with all of you. The driving is absolutely shocking and no one gets anywhere any sooner. Cyclists are at serious risk because these idiots will not take ten seconds to wait before roaring past far too close. Matter of time……. Wall failed to avoid the car. Yep, needed an arbitrator to help drive. So thankful that there were no serious injuries in this collision. , now we very seldom see any at all. We can do what ever on the road and no one cares.pease put the Bike petrol back out there. Accidents are just that…accidents. And they happen. 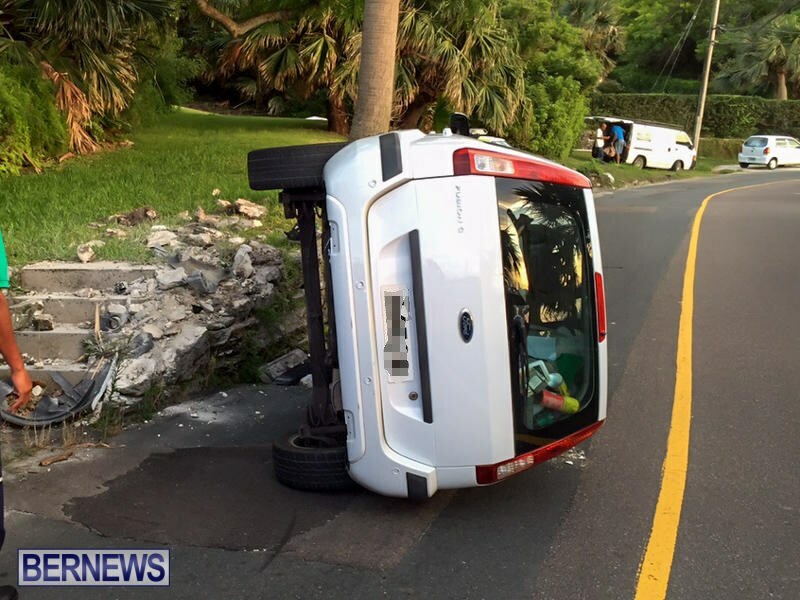 But right now Bermuda drivers are doing the most. Slow down people (not saying speed was involved but) please take a little extra care on the roads. There is a “kink” in the section between Lovers Lane and the Yacht Club ( coming into town) that throws my car off every time irrespective of speed. Assumed it was just the short wheel base of my car but if I went at the speed limit it would be enough to roll my car. Can’t see anything visible on the road or the camber. Have driven this road almost every day for some 40 years….. sometimes twice a day. The answer is NO. I’ve always stated that if I see someone texting,drinking, speeding or driving/riding dangerously whilst overtaking me and they smash down the road I’m driving right past.Ive yet to be taken up on that and I hope I never do but don’t catch me on a bad day cause you would be poo poo out of luck. No sympathy for the idiots here either. It is clear and obvious that he hit a wall. If government took down all walls this would never happen. You sound stupid, go back to School. And you apparently have no sense of humour. this is simply one of two reasons. Impaired or distracted driving. no damn dog, cat or such. Not only the walls, but Harbour Road is a terribly twisty road with turn after turn after turn. I mean just when you’ve gone around one turn, you have to go around another – and then another. Its no wonder people crash. If Government took all the turns out and made Harbour Road straight, with no walls, then accidents like this would simply not happen. But I don’t expect they’ll do anything about it. Its as if Government doesn’t care. Brand new car….somebody just got their spanking new drivers license and now allowed to drive in actuality a small ‘truck’. Not everyone can drive a truck that size on our roads. Bet she took her driving test in a car 1/2 the size of that truck! “She”?! Isn’t that a somewhat sexist assumption. If you were able to read you would note that the driver was male. No one knows the facts except the driver and any witnesses.